This week I made a fresh batch of some very chocolatey Nutella Brownies! Lacrosse season has begun and I am busier than ever! As many of you know, I am now in the second semester of my senior year of high school. College is approaching as a new journey for me, and I can’t wait to embark on it. I’m receiving letters of decision for different colleges every week in the mail, and I’m so excited to start this next chapter of my life! I haven’t decided on a school yet, but I’ll let you know when I do. Because I’m so busy, I’m trying to choose recipes that are easy to make. Nutella brownies are super easy to make! Solely based on the outward appearance, these brownies would appear to be completely normal. But do not fear, there is a special surprise under the surface: Nutella!! For those of you who may not be familiar with the product, Nutella is a delicious hazelnut spread that I am obsessed with. It’s sold in a jar near the peanut butter, and you can use it to add to desserts or spread on graham crackers or eat it by the spoonful! 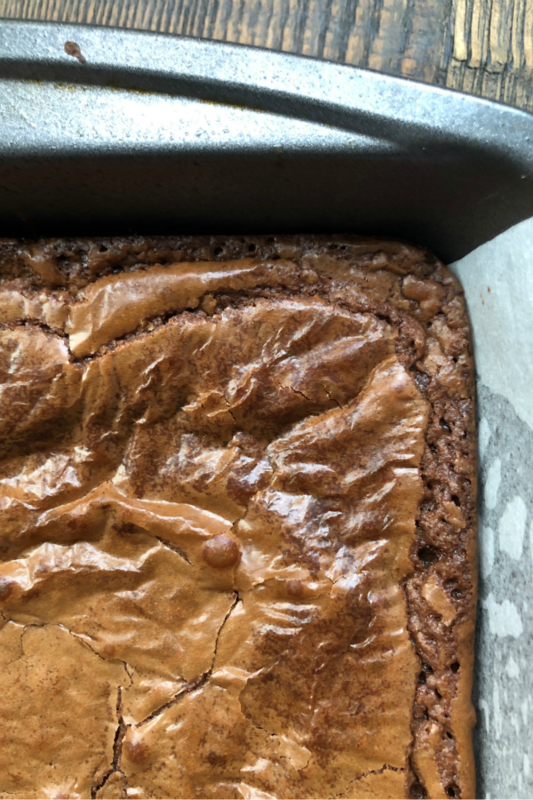 I used Nutella in the batter to produce a perfect hazelnut flavor in the brownies, and it worked out great! You’ll need an 8×8-inch pan for this recipe. Pouring the batter in the pan and smoothing it out is the easy part, but don’t forget to lick the spoon after! Brownie batter is phenomenal. 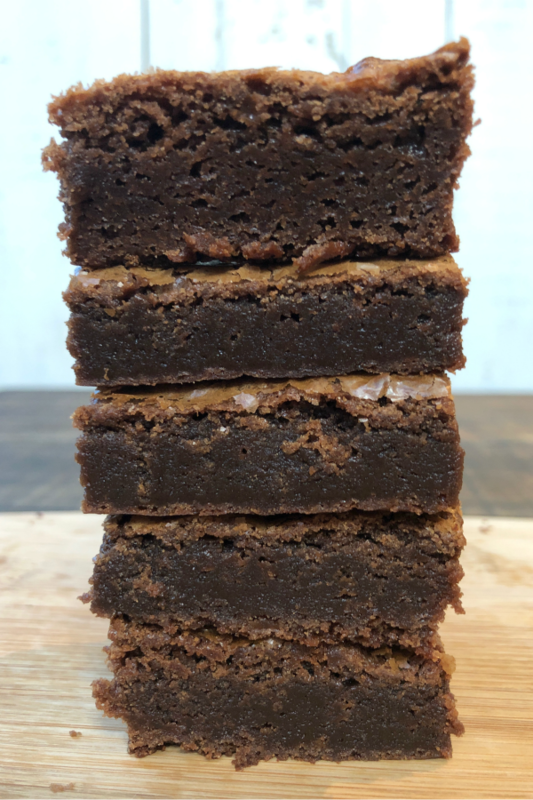 There’s not much to say about these brownies other than that they are simple and delicious. The recipe isn’t complicated whatsoever and the end result is very pleasing! 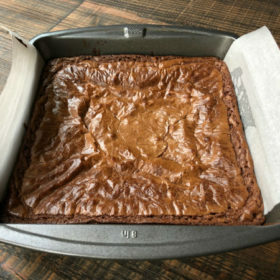 I love when brownies have that crinkle texture on top. The interior is dark and moist, showing the presence of that chocolatey Nutella. Do you prefer an inside piece or an edge? I like to cut the edges off, eat those, and then cut the rest of the brownies so they’re all inside pieces! 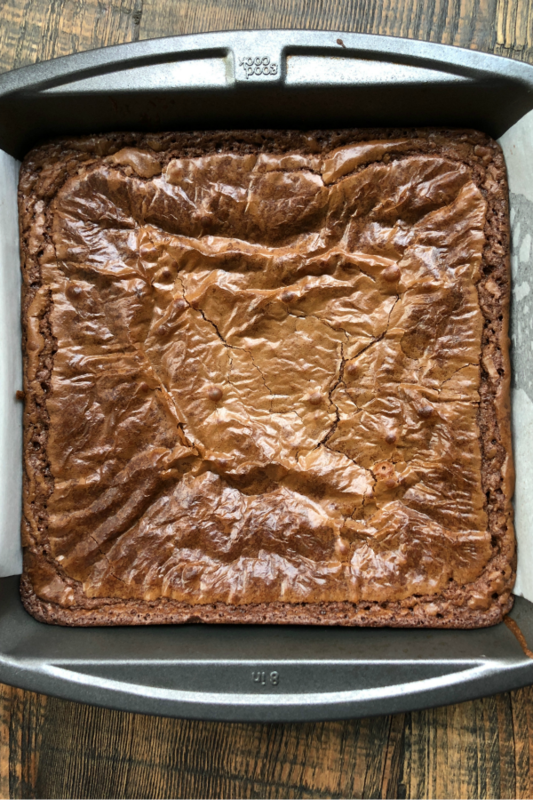 Make a batch of these Nutella Brownies today. I think you’ll be pretty happy with how they turn out. I cut mine into pieces and popped them into plastic baggies so I could store them in the freezer for daily munching. They freeze and defrost well. So delicious! 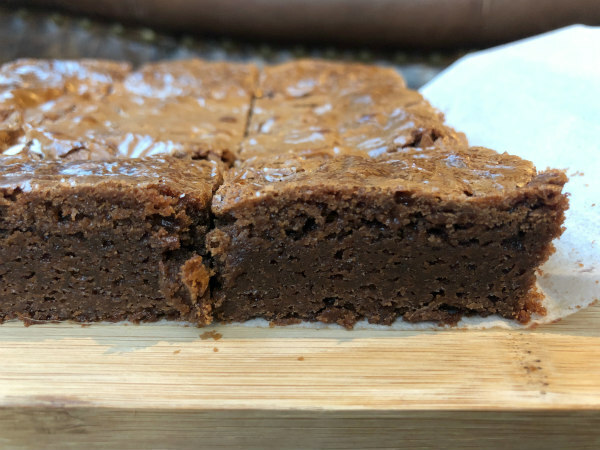 A super fudgy chocolate brownie recipe! 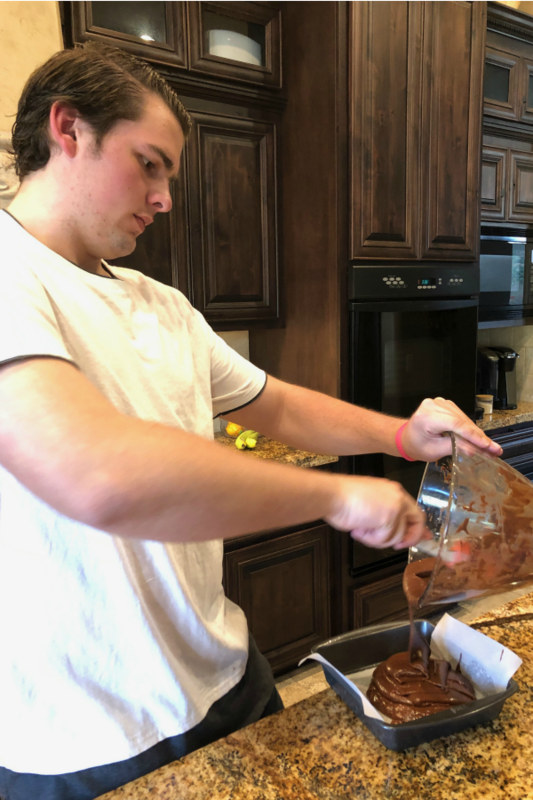 Preheat the oven to 325 degrees F. Spray an 8x8-inch pan with nonstick spray, then line it with parchment paper-- allowing the paper to extend over two opposite sides. 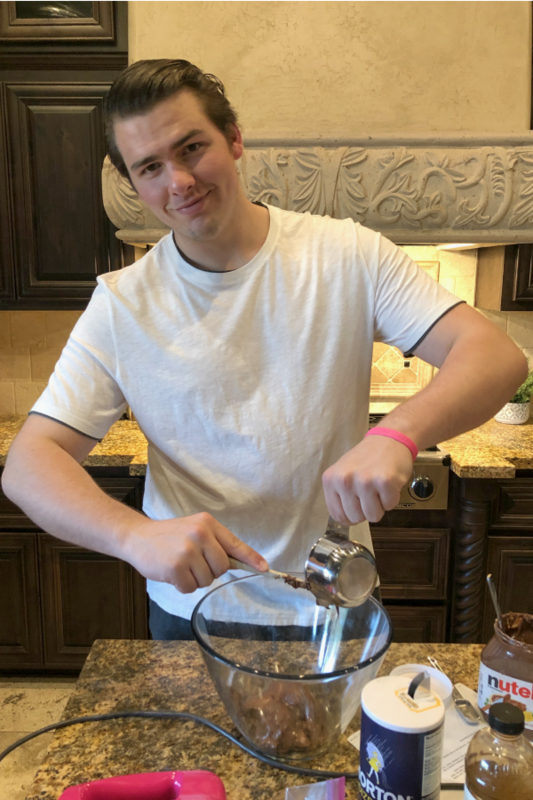 In a large bowl, use an electric mixer to combine the Nutella, brown sugar, eggs and vanilla. Beat until smooth. With the mixer running on low, add the flour mixture in two parts-- alternating with the melted butter. Scrape the batter into the prepared pan. Bake 30 to 35 minutes, or until a toothpick inserted into the center comes out fairly clean. I found them to be just right at about 32 minutes. Cool in the pan for a couple of hours. Cut into squares and serve. Store in a covered container.